Don't get caught in the rain with it though. The past few years have been flooded with rainbows and unicorn trends everywhere we turn. Hidden rainbows, rainbow undercuts, and rainbow armpit hair are just some, off the top of my head. Now there's another thing to add to the colorful list: Rainbow headbands. Hear me out! 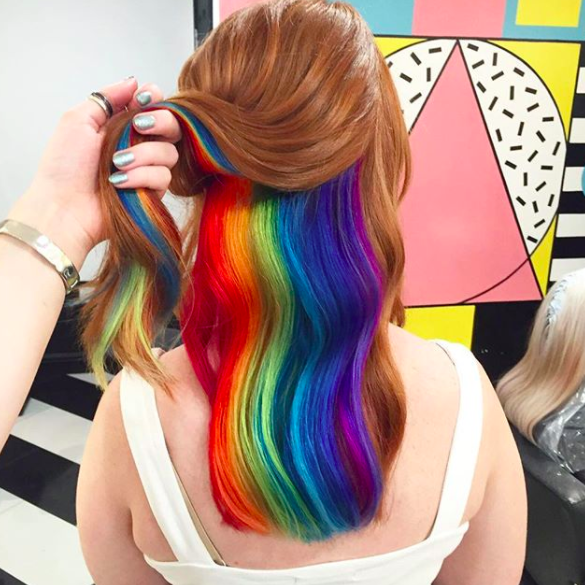 Even though stencil hair art is definitely not a new trend, Bumble & Bumble stylist Allen Thomas Wood, recently came up with this super cool, psychedelic style. To achieve this cool look, Wood bushed the hair back, simulating the person is actually wearing a headband. He then painted small sections of color freehand with different spray-on shades. Wood told Vogue that it sort of happened by mistake. Initially he was trying to create a monochrome painted headband, but he kept on layering Kryolan colors so it transformed into a rainbow gradient. Though he used hairspray to secure every hair in place, Wood wouldn't recommend getting caught in the rain with it, since the temporary color isn't waterproof. But if you're careful enough, it's safe for a night out.